Once a vehicle is lowered, wheel camber may become excessively negative, meaning the top of the tire is angled inward (toward the center of the vehicle). While some negative camber aids in improving traction and road adhesion, too much can result in compromised handling and accelerated tire wear. Eibach offers a complete range of Pro-Alignment kits, which provide a simple, affordable solution to correct excessive negative camber. 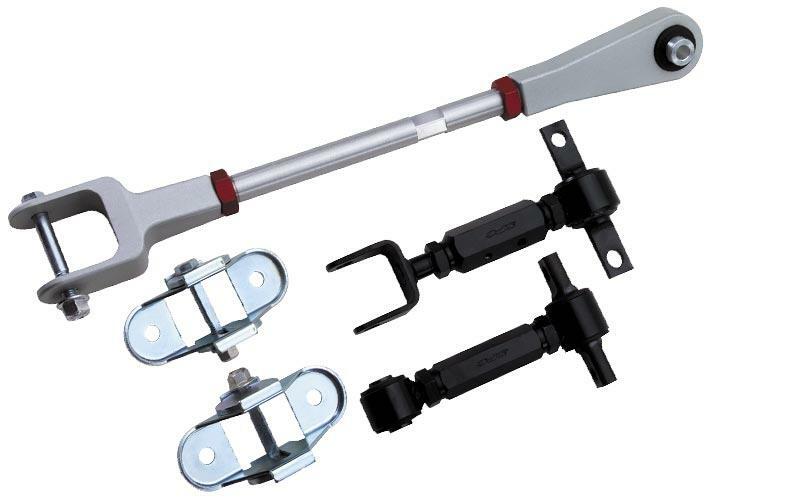 These alignment kits not only assist in adjusting a vehicle’s camber back to factory specifications, but they also allow an experienced chassis tuner to utilize the increased adjustment range to “dial-in” a performance-oriented alignment that uses negative camber to maximize a chassis’ true potential. With correct alignment, turn-in becomes more precise and handling becomes gratifyingly crisp and predictable. Highspeed stability is also enhanced, making an Eibach Pro-Alignment kit a necessity for the serious performance tuner. After the installation of either an Eibach Pro-Kit, Sportline spring kit or Pro-Street-S coil-over kit, a vehicle’s alignment should always be checked. Eibach Performance Control arms are designed to allow wider wheel and tire combinations and solve tire-rubbing problems when teamed up with our front and rear Pro-Alignment camber kits and toe adjusters. Available for most popular applications. The numbers shown represent averages’ actual camber change will vary depending on vehicle model.